Borage flowers grow on hollow stems that are covered with fine white hairs. The tiny flowers are star-like in shape and can be blue, lavender or purple in color. From the center of the flower protrudes five stamens and black anthers. When fresh both the flower and leaves offer a mild herbal cucumber flavor and aroma. Look for Borage flowers in the spring and summer months. Borage flowers can be added to fruit and green salads or used as an edible garnish on cakes, cold soups, ice cream and delicate pastries. Try adding to the brine when making pickles. Their refreshing flavor complements light summer beverages. Add whole flowers to lemonade, white wine sangria and spritzers or freeze flowers in ice cubes to add a colorful pop to lightly hued cocktails. A native to northern Africa and Eurasia, the borage flower prefers full sun or partial shade conditions and can thrive even in areas with poor soil quality. 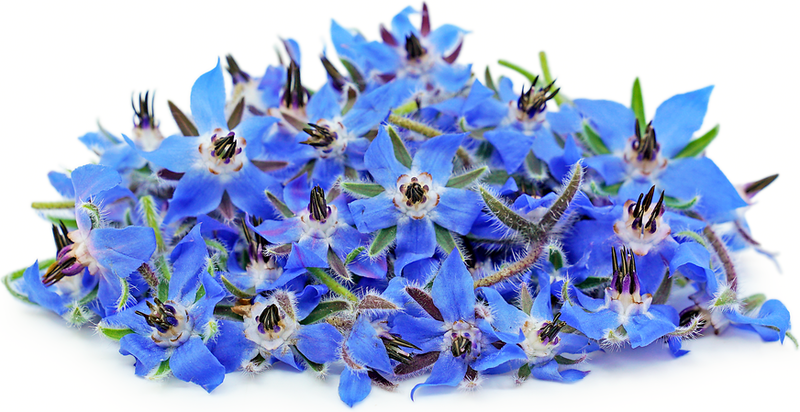 Borage flowers have been used for centuries for both their medicinal and culinary properties. Recipes that include Borage Flowers. One is easiest, three is harder. 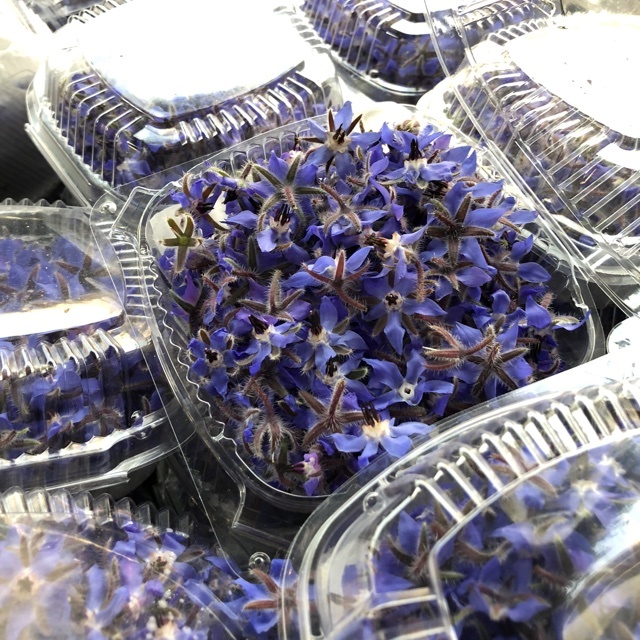 People have shared Borage Flowers using the Specialty Produce app for iPhone and Android. Sharer's comments : Borage Flowers spotted at Santa Monica Farmers Market.